It's night, it's the woods, and, you guessed it, a woman is screaming for help as she flees for her life! Because, you know, Criminal Minds. A helpful Chyron lets us know that it's 2013, but since I'm not super-clear on when this episode originally aired, I'm going to guess that's fairly recent, like the year before the episode's present day. The lady runs out of the woods, and is immediately hit by a car! Was it a super-effective killer, or just a preposterously-timed accident? In the present day, we head to an institute for the mentally unstable in New York State! Derek has arrived to help prep the victim before the trial! The doctor working the case is surprised to see a profiler doing that, but he explains that profiling is only 10% of what they do, and trial prep is an important part of the job. While I'm sure that's closer to true in the real world, if it was a part of the team's job, I'm sure it would have come up more often in the past 200 episodes. We're expected to believe that in addition to solving 25 serial murders a year they're also flying around the country - individually or in groups - to help out local DAs? That seems like a stretch. The victim is playing solitaire when Derek arrives, and she looks to be in pretty solid shape, so I suppose the truck impact wasn't too severe! Nice to know that someone's obeying the speed limit on a dirt road in the middle of the night. Derek wants to prep her for cross-examination by going over all of the details of the case, both her experiences, and the things they've turned up in their own investigation over the past year! Wait, are we expected to believe that the team continued investigating the case after catching the guy, because that's absolutely not their MO. Let's just assume he meant 'we' in the 'all law enforcement' sense of the word. Specifically, they're going to go into more detail about what happened to 'Ben', who she saw being carried out into a field by two goons, beaten to a pulp! Time for a flashback to fill us in on some of that backstory! 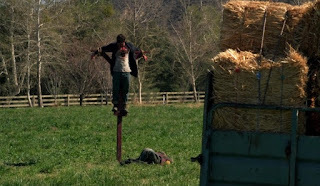 He was turned into a human scarecrow. Ick. The victim thinks she should have done more to stop the murder. Was she one of the killers? If not, I'm not sure how she would have. Then it's over to the team who (in the past) are getting the details of the case! It seems three victims were stabbed to death with farm tools and dumped in public, all within the last ten days. So it's off to New York. More present day stuff, as the victim sets up another flashback! Wait, whose flashback was that scene in the office? It seems like the show is so desperate to keep to its standard format that they're just throwing out the whole 'Derek coaches a victim' concept whenever they feel like it. Anyhow, in the victim's flashback, another victim has stolen a key from the killers, and they break out after the villains have gotten drunk. But they make too much noise, and as they flee across a field, the other lady is shot in the back! The victim keeps running, though, because really, what can you do when the killer has a rifle and you don't? Let's see how the flashbacks continue after the credits! Posted by Vardulon at 1:22 AM 2 "comments"